Fruits and vegetables don’t only hold the key to better health overall, they can be used to treat and prevent very specific ailments. For example, using ginger to fight an upset stomach or cranberries to prevent urinary tract infections are two well-known plant-healing remedies. Another notable example is with tart cherries, and how the tiny red fruit can effectively fight inflammation and prevent arthritis. According to researchers with Oregon Health & Science University, tart cherries have the “highest anti-inflammatory content of any food”. This is a remarkable statement considering all of the fruits and vegetables with anti-inflammatory properties. 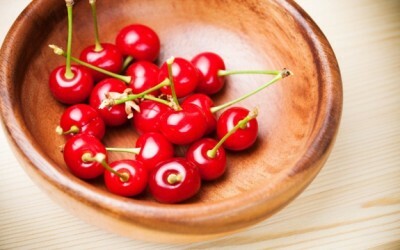 These anti-inflammatory properties are also likely responsible for the many health benefits of cherries. The researchers discovered that tart cherries, like Montmorency and Balaton in particular, are rich in phenolics and anthocyanins, more so than sweet cherry varieties like Bing, Lambert, and Rainier. These compounds are known to reduce inflammation considerably, which is why cherries are quickly rising as one of the best home remedies for gout and other inflammatory-related issues. In this particular study, the researchers analyzed 20 women between the ages of 40 and 70 with inflammatory osteoarthritis. The women drank tart cherry juice twice daily for three weeks. At the end of the three week period, the researchers found “significant reductions” in inflammation markers. The reductions were most pronounced in women who had the highest inflammation levels at the start of the period. A study from 2001 indicated the anthocyanins in tart cherries were as effective as ibuprofen and naproxen (over-the-counter inflammation and pain medications) at suppressing enzymes associated with arthritis. Best of all, there are no side effects. Another previous study—this one from Baylor Research Institute—found that a single daily dose of tart cherry extract helped reduce pain associated with osteoarthritis but more than 20 percent. Natural pain relieving and anti-inflammatory foods should be staples in the diets of people who have to deal with conditions like arthritis. The alternatives—like ibuprofen, naproxen, and acetaminophen—can be quite dangerous. For example, research spanning from 1995 to 2006 found a connection between hearing loss and ibuprofen use. But hearing loss isn’t the only risk. Over-the-counter pain medications have also been tied to birth defects, blindness, strokes, and intestinal bleeding. Natural alternatives include tart cherries, curcumin (found in turmeric), and willow bark – all effective options without the side effects. We’ve been using tart cherry juice for years. It has rid us of bone and joint pain and also works as a sleep aid. The problem is that it’s hard to find. Our grocery stores no longer carry it. So we order it from Brownwood Farms in Michigan online. There are other online sources, too. We get it by the case. We put about 2 oz. in a glass and add water and have it in the evening before bedtime. It’s great.